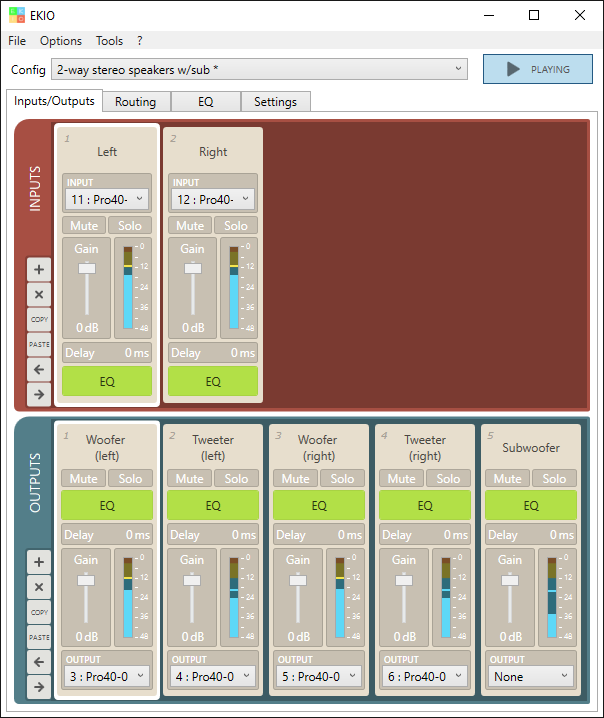 EKIO is a Loudspeaker Management Application. It lets you customize the sound of your loudspeaker system so that it sounds and performs optimally. The app allows you to easily create a crossover for your full-range speakers. It lets you integrate a subwoofer and equalize your system. EKIO can import speaker measurements, allowing you to achieve the finest settings and get the best audio performance. EKIO is a Windows application. It works with an ASIO audio interface or a WDM sound card (by using a generic ASIO driver). 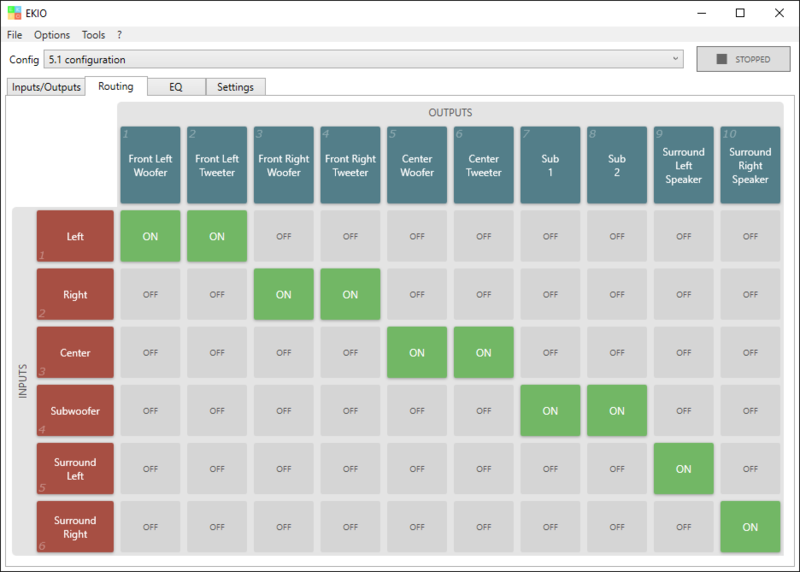 EKIO handles an unlimited number of inputs and outputs. Each of them provides intuitive equalization, an individual crossover filter, gain control, delay and solo/mute switches. The EKIO interface allows setting your filters quickly and easily with a convenient interface. 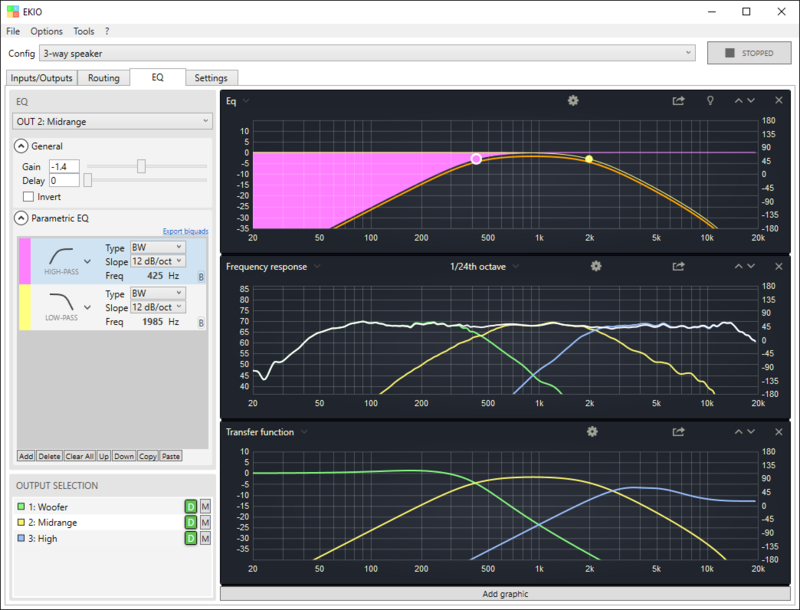 Many graphs are displayed: EQ curves, frequency responses, transfer functions, off-axis frequency responses (horizontal and vertical) and group delay. With its sophisticated DSP engine and algorithms, EKIO provides both high-precision filtering and low CPU usage. 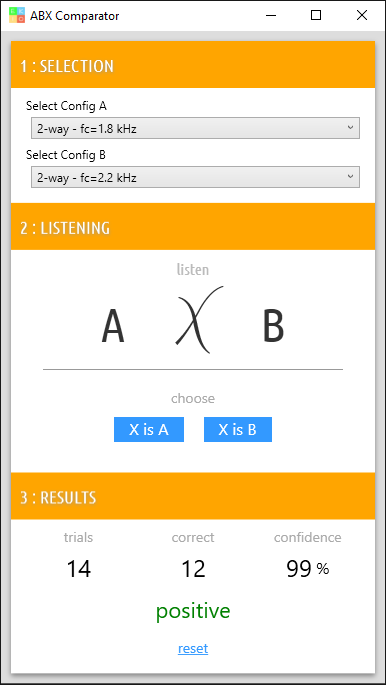 EKIO can import on-axis and off-axis frequency responses, helping you get the most out of your sound system. Filters can be exported as biquad coefficients to be used on another device (e.g., MiniDSP). ASIO provides a low-latency and high-fidelity interface between a software application and a computer's sound card. It is widely used by studios, musicians, professionals and amateurs. What we think influences what we hear. 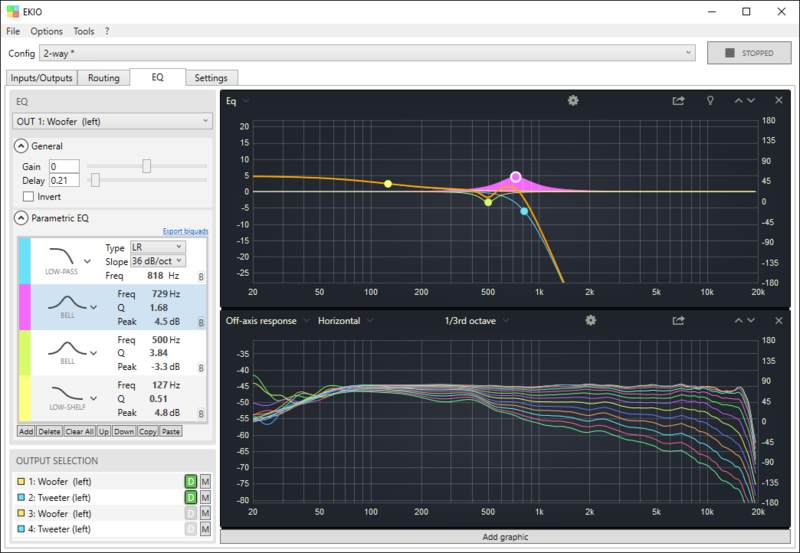 The ABX comparator is a tool to compare two filters blind, eliminate bias, and thus enhance your listening accuracy. EKIO can load at Windows startup and automatically start audio processing. It can also be minimized to the system tray. Your opinion is important to us. We appreciate your feedback and will use it to make EKIO a better software. Please let us know what you think about EKIO at our contact address.